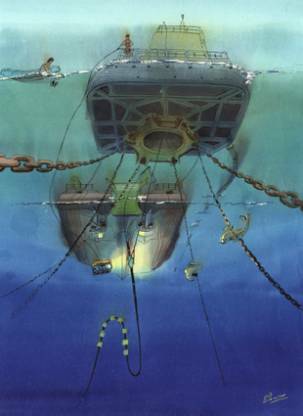 This painting shows the whole worksite, the calm bouy is in the foreground with an assistant on board the bouy deploying the rov’s tether, the inflatable nearby is a safety boat, and the rov can be seen in the danger area close the vessel’s thrusters providing a picture as the damaged riser come over the aft deck of the vessel. To the right leaving the calm bouy and laying to the right of the vessel is the pick up export line from which the tankers receive oil. The chains you see are the anchors for the bouy.